He was born in Saint Louis, Missouri on November 15, 1925 to Matthew and Grace Hynes (nee Hogan). Matthew was a Machinist at Anheuser Busch for 35 years and was in the Machinists Union. He was also in the Knights of Columbus and proudly served as a Marine in Okinawa during World War II. Matthew and Betty Hynes were married for 71 years. Granddaughters, Kelly Steinway, Jill Klenc, Lindsay Vassallo, Kristen Kujawa, and Grandson, Jeff Hynes. 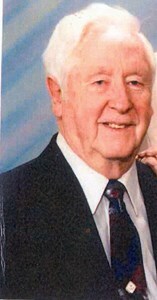 Matthew also had nine Great-Grandchildren and will also be dearly missed by many other family members and friends. A visitation and services will be at a later date. To share a memory of Matthew or leave a special message for him family, please click the Share Memories button above. Add your memories to the guest book of Matthew Hynes.